Design with Echoes | Faddegon's Nursery, Inc.
An easy way to create a more beautiful, unified garden is to play the color echo game. 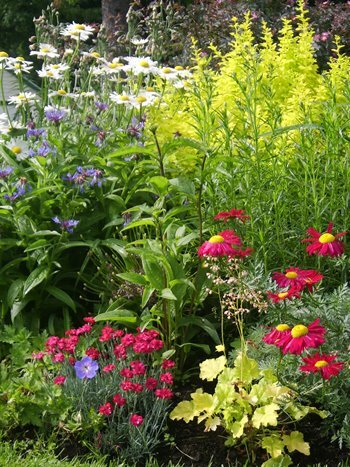 This simply involves repeating a similar color among mixed plants, objects or hardscapes. For instance, let’s pick yellow as a color echo. I could group yellow, repeat blooming daylilies ‘Going Bananas’ near a ‘Good Vibrations’ Juniper (yellow-needled, evergreen creeping juniper) and then tuck in some ‘Lemon Slice’ Million Bells, an annual that blooms through fall with no deadheading. Or how about using blue as the color echo? Plant some blue Browallia (an annual that blooms in sun or shade and requires no deadheading) around a blue-leaved Hosta ‘Blue Angel’ and then place a bright blue container, filled with cheerful annuals, nearby. Bingo!